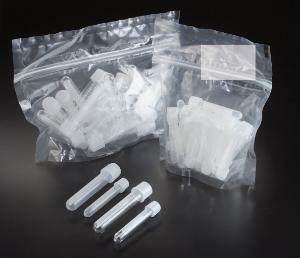 Transparent polystyrene tubes will withstand moderate centrifugation speeds (1400g) and temperatures to 70°C (158°F). Translucent polypropylene tubes can be centrifuged at higher speeds (3000g) and resist temperatures from –190 to 120°C (–310 to 248°F). Tubes are supplied with either a 2-position ribbed polyethylene cap (which can be left loose for aerobic work or sealed for anaerobic cultures), or without caps for general-purpose work. 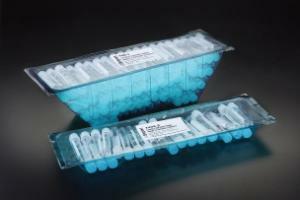 Tubes are placed in a convenient space saving plastic tray oriented horizontally. State-of-the-art packaging keeps tubes neatly aligned for easy manipulation. For users who prefer more compact packaging, see T405/T406 series. They are biologically inert and exempt from mold release agents. Precision molding with virgin thermoplastics ensures that the tubes will be uniform in size and shape. High resistance to breakage reduces danger in handling infectious or other potentially harmful cultures. Ordering information: All tubes are supplied sterile.